Fellow blogger and all around cool guy 4DK (of Die Danger Die Die Kill) pointed out to me this morning that the Roxie Theater in San Francisco is doing a Pre-Code marathon for the next week, including showing some real rarities and a talk by Lyle Talbot’s daughter. Why does no one tell me about these things?! It’s called Hollywood Before the Code: Deeper, Darker, Nastier!! and it looks like it’ll be a blast. Here’s the film list, in case you needed recommendations or wanted to know what I’m seeing. I live about an hour outside the city (and dear god I hate trying to find parking in San Francisco), so I’m not sure how many of these I’ll actually be able to make, but some are extremely tempting. Five Star Final (1931) @ 8:00 – I actually just watched this a week or two ago, and have a review of it coming up on Friday. Since you can’t see it yet, this is a fun flick with Edward G. Robinson as a newspaper editor who lets the seedier elements of his profession get away with destroying an innocent girl’s life. It’s a nice angry little film, though I can’t say it’s essential big screen viewing especially since it’s a bit on the long side at ninety minutes. It was also nominated for Best Picture, for what it’s worth. Blood Money (1933) @ 6:30 and 9:45 – My review is here. I probably need to revisit it since that was one of my earliest reviews, but I’m not going to run out and catch it in the theater this go around. Dr. Jekyll and Mr. Hyde (1932) @ 3:00 and 8:00 – Now this I’m excited about. I haven’t written a review of it for the site, but it’s easily one of my favorite films of all time. Mamoullian has a blast using the camera to implicate the audience in much of the story, and Frederic March was rarely better. I’m going to try my damnedest to make this one. Murders in the Rue Morgue (1932) @ 1:30 and 6:30 – I’ve heard a lot of good things about this Edgar Allen Poe adaptation, but I haven’t seen it. Yet. 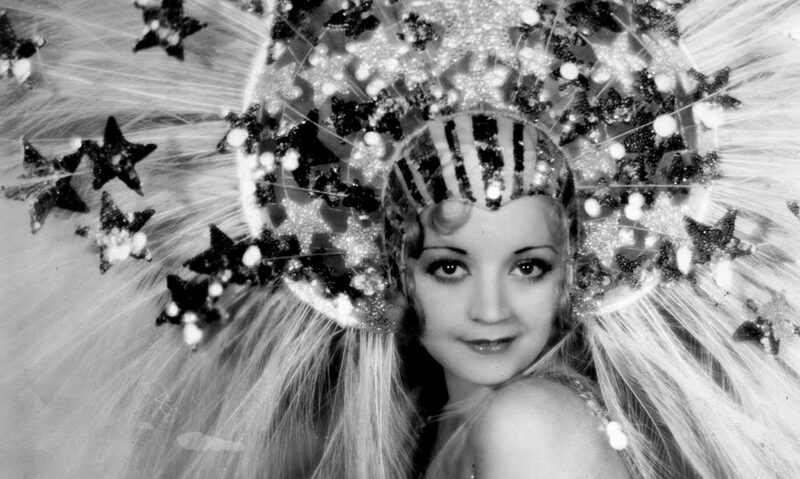 Shanghai Express (1933) @ 3:30 and 7:30 – There are a lot of people who go gaga for the Marlene Dietrich/Josef Von Sternberg Pre-Code films, which include this and The Blue Angel and The Scarlett Empress. Personally, Shanghai is probably the best of the three and is very luscious. I probably won’t make it, but this is a great pick. Waterloo Bridge (1930) @ 1:45, 5:30 and 9:30 – Of course, the reason I’ll probably skip Shanghai is because I have no interest in the other half of its double feature, Waterloo Bridge. My review from a few months back is here. Safe in Hell (1933) @ 6:20 and 9:00 – In what is very much a “Are you kidding me? !” moment, this was definitely in my top ten movies I thought I’d never ever see on the big screen. It’s an absolute favorite, gorgeous and dark in all the right ways. I wish there was an earlier show, but if you’re going to see anything at this Pre-Code fest, I’d go with this. Here’s my glowing review. Man’s Castle (1933) @ 8:00 – My review. Really good flick, and pretty hard to come by as well. Also lots of fun if you’ve ever wanted to see Spencer Tracy or Loretta Young go skinny dipping together; don’t lie, everyone wants to see Spencer Tracy skinny dipping. Virtue (1932) @ 6:30 and 9:40 – Well, this is the first one they’re showing that I’ve never even heard of, let alone seen. 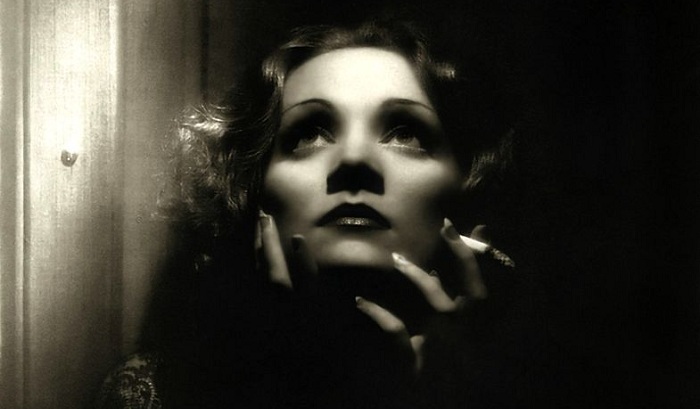 It’s a Carole Lombard movie about a prostitute who falls in love with a cab driver. Since it doesn’t have a DVD release, this may be worth catching. Lady Killer (1933) @ 8:00 – Another one I haven’t heard of, with James Cagney as an usher turned crook turned movie star and Mae Clarke supporting him. Can you imagine? It looks like this is on Warner Archive Instant, so I’ll probably just catch it there, though for anyone closer by, it’s hard to say no to Cagney on the big screen. Night World (1932) @ 6:30 and 9:40 – Now this is worth going out of your way for. Another one not released on DVD, this rarity is the Universal Studios equivalent of Grand Hotel. Boris Karloff, Lew Ayres, Clarence Muse, and Mae Clarke all star, with a really swell musical number by Busby Berkeley popping up in the mix as well. My review; see it! The last day has a double feature of Lyle Talbot movies (both unseen by me) and a presentation by his daughter, Margaret, about the man. If you’ve seen Fog Over Frisco (with Bette Davis) or Heat Lightning, you’ll have one up on me. I think I’ll already be dead from all my trips into the city, but for fans of Talbot it’s probably too good to pass up. Here’s the Roxie’s page on the event, and here’s the theater’s location while we’re at it. I unfortunately have a lot of homework for school coming up the next two weeks, but if I make it to any of these, hopefully I’ll see you there! 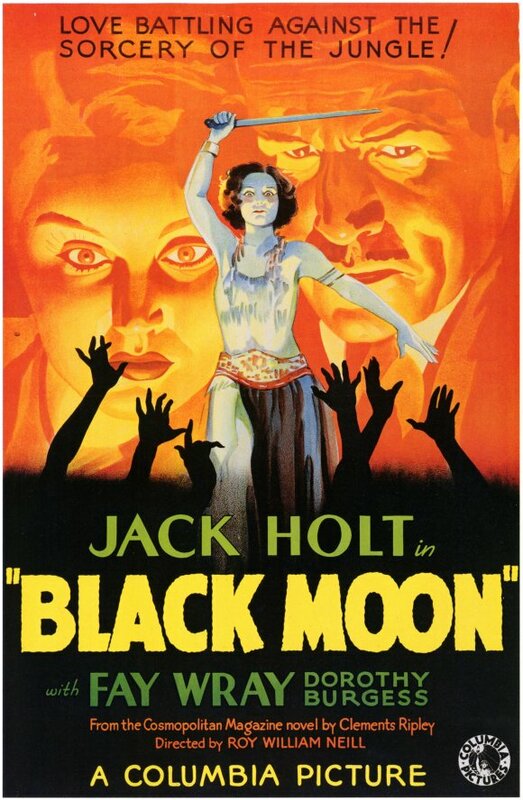 I haven’t heard of ‘Black Moon,’ but that poster would be enough to get me into the theater. Has anyone ever talked about the lost art of movie posters? ‘Murders in the Rue Morgue’ stars Bela Lugosi, which should get anyone up and running to see it (it’s also on DVD, in a Bela Lugosi collection). It’s creepy and grim, especially a scene where Bela tortures a prostitute (played by a debuting Arlene Francis). And it’s also short, barely an hour long – all in all, worth catching. There are some good sites for movie poster discussion, though most of it is contemporary. There are some fantastic Pre-Code posters; that might make a good post when I have some down time again. I’m looking forward to Murders; hopefully I can get someone to go with me to see it! I heard about the Film Forum retrospective, but I’ll admit I had no idea it was still going on; if I’d had a little more foresight, I’d have written a post about it too. So many drool worthy films, I wish I could camp out in New York and see ’em all. VIRTUE, among other virtues, showcases Mayo Methot in the second female lead. She rocks the screen. I loved what you said about her performance in THE MIND READER. Sweet! I re-checked and I think it’s on DVD somewhere. That just bumped it up in my queue considerably. Thanks for the info!